UPDATED: Wed., Jan. 17, 2018, 10:58 p.m. Threat of a federal government shutdown has put members of the Inland Northwest’s congressional delegation at odds with one another, even as Republicans dangle long-term funding for a popular program providing health coverage for children. 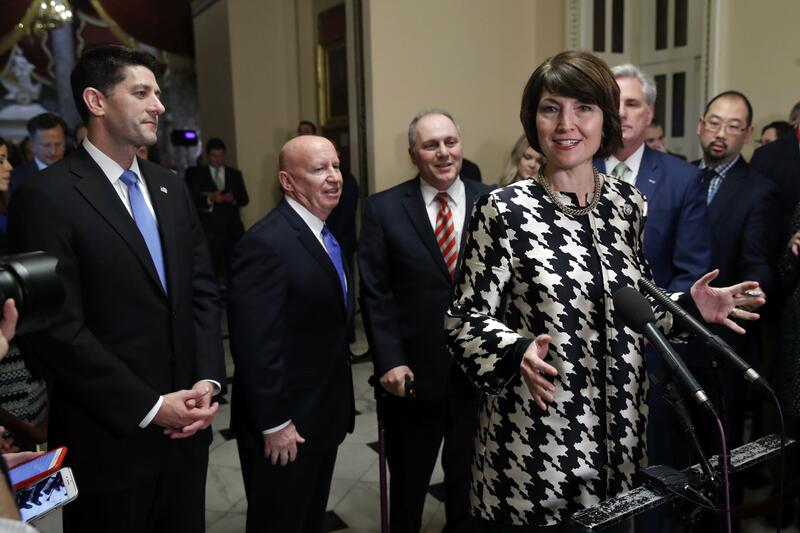 Rep. Cathy McMorris Rodgers, chairwoman of the House Republican Conference, joined several of her GOP colleagues late Wednesday on Capitol Hill to pressure Democratic lawmakers to vote for legislation that would fund the government through Feb. 16. Earlier this week, Republicans introduced a resolution pairing government funding with a six-year extension of the Children’s Health Insurance Program, which provides assistance to about 4,100 kids in Spokane County whose families earn too much to be eligible for Medicaid but can’t afford other plans. McMorris Rodgers said Democrats would be to blame if funding for the program, known as CHIP and administered as Apple Health in Washington state, isn’t reauthorized as states across the nation face dwindling reserves in their accounts. But Democrats, including Sen. Patty Murray, have accused the GOP of dragging its feet on the issue in favor of pushing last year’s tax reform legislation and paying for extension of the program with funding cuts to the Centers for Disease Control. Democrats also have called for the government spending bill to include a measure protecting the children of those who immigrated to the United States illegally. McMorris Rodgers said a deal on that issue, seemingly scuttled by President Donald Trump, should be made as quickly as possible, but that funding for the health coverage program shouldn’t be put at risk in those talks. “There’s no good reason to punish children today by keeping Congress from CHIP authorization,” the congresswoman added. Republicans have reportedly added the provision, which funds the program through 2023 without the funding mechanisms that made some Democrats squeamish, in an attempt to garner votes from the other side of the aisle for the House bill, as right-leaning Republicans express unease about a lack of increased defense spending. That has prompted fears the spending measure could be defeated over opposition from the right. Fifteen Democrats voted in favor of a bill, passed at the beginning of October, that would have funded CHIP as well as a two-year extension of funding for health centers that serve rural communities. That legislation never reached the Senate floor. The bill introduced Wednesday, championed by McMorris Rodgers, doesn’t address the health center funding, which isn’t set to expire until later this year. The omission prompted condemnation from Murray in the halls of Congress on Wednesday. Washington’s senior senator charged Republicans with prompting the government shutdown by refusing to negotiate on a longer-term spending plan for the federal government. “As we have heard, right now House Republicans are talking about another short-term extension. Another cop-out. Another can kicked down the road,” Murray told reporters. A spokesman for Sen. Maria Cantwell said she supported long-term funding for CHIP but was still reviewing the House legislation. It’s expected to come to the floor for a vote Thursday. Published: Jan. 17, 2018, 5:07 p.m. Updated: Jan. 17, 2018, 10:58 p.m.